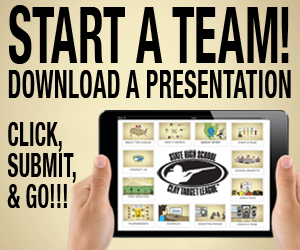 Earn team points against your entire conference! The Kentucky State High School Clay Target League has developed an exclusive True Team® scoring format that will help determine the overall performance for a team in all weekly events during the season. In the True Team® scoring format, each team has a pre-determined number of competitors that will contribute to their team’s score, with each competitor scoring at least one point. The top score in a conference will receive the maximum number of points and the last score will receive the minimum one point unless there is a tie and the remaining points are split equally. Each conference will have a different total of the points available for each event because each conference will have a different number of qualifying athletes and perhaps a different number of teams. Teams are assigned a conference based on a similar number of members on a team. The number of scores used is determined upon a team’s conference designation at the time of assignment. Smaller conferences with smaller teams will use less scores. Larger conferences with larger teams will use more scores. The same number of team members must be used for each team to provide equal opportunity to earn points. See the Conference True Team® Scoring Assignment Examples below. All athletes shoot at their assigned 50 targets on their team-assigned event day of the week. The Head Coach enters all scores in the Leagues’s Team Management System™ before Saturday at 9 p.m.
All athletes shoot their 50 targets. The top scores, as determined by the qualifying number of scores used for your team each week, are compared against all other teams within your conference. See the True Team® scoring example to the right. The top score receives the highest number of points available and the remaining scores are assigned based on decreasing subsequent scores until to the last qualifying score that receives one point. Scores that are tied will equally split the earned points. Athletes who do not qualify for the week’s top finishers are recorded and submitted, but not used. Scores are published on Saturday at 9:05 p.m.
All athlete scores are added to determine the total team score for that event. The team score is then compared against all of the scores of the other teams in their conference to determine weekly and overall standings. All completed event scores are added to determine the standings based on the highest number of points earned. The team that ends the season with the highest number of points earned wins their conference. The Shooter Performance Tracker® (SPT) is a performance tracking tool provided to all participants of the League. Each athlete receives personal access to monitor their scores and progress compared against their team, their conference, and all other athletes in the state. 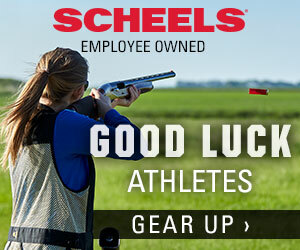 Athletes can share access to to their SPT so friends and family can watch their favorite clay target league athlete! Check out the SPT example!